This study is based on a manuscript which was carried by a Chinese monk through the monasteries of the Hexi corridor, as part of his pilgrimage from Wutaishan to India. The manuscript has been created as a composite object from three separate documents, with Chinese and Tibetan texts on them. Included is a series of Tibetan letters of introduction addressed to the heads of monasteries along the route, functioning as a passport when passing through the region. The manuscript dates to the late 960s, coinciding with the large pilgrimage movement during the reign of Emperor Taizu of the Northern Song recorded in transmitted sources. Therefore, it is very likely that this is a unique contemporary testimony of the movement. The letters of passage to and from high-ranking Tibetan monks show the vibrancy of the Tibetan monasteries in Amdo during this period, towards the end of Tibet’s ‘era of fragmentation’. Complementing extant historical sources, the manuscript provides evidence for the high degree of ethnic, cultural and linguistic diversity of the period. 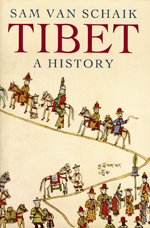 Sam van Schaik brings the history of Tibet to life by telling the stories of the people involved, from the glory days of the Tibetan empire in the seventh century through to the present day. He explores the emergence of Tibetan Buddhism and the rise of the Dalai Lamas, Tibet’s entanglement in the ‘Great Game’ in the early twentieth century, its submission to Chinese Communist rule in the 1950s, and the troubled times of recent decades. In 2004 the first specialist conference on the Silk Road kingdom of Khotan was organised at the British Library. It was held to coincide with the opening of the exhibition, The Silk Road: Trade, Travel, War and Faith, which had a section on Khotan. The conference brought together scholars worldwide working on the history, art, religions, cultures and languages of Khotan. The papers presented at the conference and others by leading scholars who were unable to attend were published as a special section in The Journal of Inner Asian Art and Archaeology , Issue 3 (2008) published by Brepols with Ursula Sims-Williams as guest editor. It also contains maps, illustrations and a bibliography. Tradition and Innovation is published by the National Library of China and brings together a collection of papers given at the Sixth International Dunhuang Project’s Conservation Conference held at the NLC in April 2005 on the conservation of Central Asian material. Tradition and Innovation will be an informative and useful publication for professional conservators and curators, researchers in paper chemistry, librarians, manuscript specialists, postgraduate students and specialists in digital conservation and restoration. We are expecting copies to be available in October 2007. 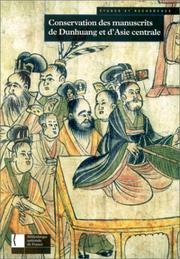 This book is about the variability of Chinese writing in early China. The archaeological discoveries of the last few decades have provided an unprecedented amount of Warring States texts in the form of manuscripts and inscriptions on various objects. From the point of view of palaeography, an intriguing challenge is how to fit all this new material into the early history of Chinese writing. Since these new texts predate the Qin dynasty, they are able to provide the modern researcher with undigested data regarding the nature of writing in Warring States China. With the sudden increase of original documents, it has become clear that we need to revise our views regarding the nature of early writing, as well as the process and effect of the Qin unification. The new material, the author argues, refutes the traditional linear model of the evolution of writing in China. According to this model, characters developed along a single line from the Shang oracle-bone inscriptions to Zhou bronze inscriptions, all the way to the Qin small seal and Han clerical scripts. The author argues that this view is not only an oversimplification but in many cases is incorrect. This model mirrors the ideologically motivated unilateral genealogy of traditional historiography which traced the mandate of Heaven from mythical emperors to the ruling house. Contact IDP for order details. This 400-page fully illustrated colour catalogue of the 2004 British Library Exhibition is edited by IDP Director Dr. Susan Whitfield and contains detailed information on all the exhibits as well as essays by leading scholars in the field. 400 pages, 290 x 220mm, 350 colour ills. UK Edition out of print, US edition available from Serindia Publications. READERSHIP: Professional conservators and curators, researchers in paper chemistry, librarians, manuscript specialists, postgraduate students and analytical chemists. A collection of nineteen authoritative papers from leading conservators and curators at the major international institutions holding documents from Dunhuang and Turfan. The papers were presented at a meeting in October 1993 and are reproduced in this inaugural volume of the series. The papers give a unique insight into conservation practice, methods and theory, and the practical application and development of scientific techniques to further the preservation of ancient artefacts and documents. 112 pages, 234 x 156mm paper, 20 b/w and 2 col ills. The paper of the Dunhuang Diamond Sutra is dyed yellow with an extract believed to originate from the Amur cork tree, Phellodendron amurense, of which the alkaloid berberine is know to be a principal colorant. There are believed to be some 40,000 other documents around the world dyed yellow in this manner. Berberine is also present in many other plant extracts traditionally used as dyes and pigments for papers and fabrics. An understanding of the chemistry of berberine is vital to the preservation of the Dunhuang Diamond Sutra and other similarly dyed documents in need of conservation. In this book, the aspects of the chemistry of berberine relevant to the conservator are detailed, and its spectroscopic characteristics and chromatographic isolation, with particular emphasis on its detection in dyes and dyed material, are also described. A detailed chapter on the components of dyes, namely huangbo and kihada, derived from the bark of Phellodendron amurense variants is included. The authors' own published works in this field are reviewed, and the results of further studies by the authors, as yet unpublished, are mentioned briefly. AUTHORS: Kenneth R. Seddon is Professor of Inorganic Chemistry at The Queen's University of Belfast and an EPSRC and Royal Academy of Engineering Clean Technology Fellow. Dr Peter J. Gibbs is a Research Fellow in the Chemistry Department, University College London. 69 pages, 234 x 156mm paper, 20 b/w and 2 col ills. Professor Fujieda Akira from Kyoto University, Japan, was the leading figure in bringing the problem of Dunhuang manuscript forgeries to light and the results of his work and that of leading scientists, conservators and scholars in the field - using analysis of the calligraphy, use of ancient words, chemical testing of the dyes and paper fibres - and brought together in the first major discussion of this issue. The introduction to this volume is available online here. 358 pages, 234 x 156mm paper, 105 b/w and 12 col ills.